This diameter is measured over the outside bark using a diameter tape at the point forester's call "breast height." Breast height is specifically defined as a point around the trunk at 4.5 feet (1.37 meters in metric using countries) above the forest floor on the uphill side of the tree. 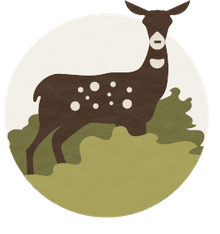 For the purposes of determining breast height, the forest floor includes the duff layer that may be present but does not include unincorporated woody debris that may rise above the ground line. It may assume a 12-inch stump in commercial forests. DBH has traditionally been the "sweet spot" on a tree where measurements are taken and where a multitude of calculations are made to determine things like growth, volume, yield and forest potential. This spot at breast level is a convenient way of measuring a tree without the need to bend your waist or climb up a ladder to take the measurement. All growth, volume and yield tables are calculated to correspond with DBH. There are at least three devices you can use to measure a tree diameter. The most commonly used device is a diameter tape that reads directly into a measurement of diameter in given increments of your prefered unit of measurement (inches or millimeters). 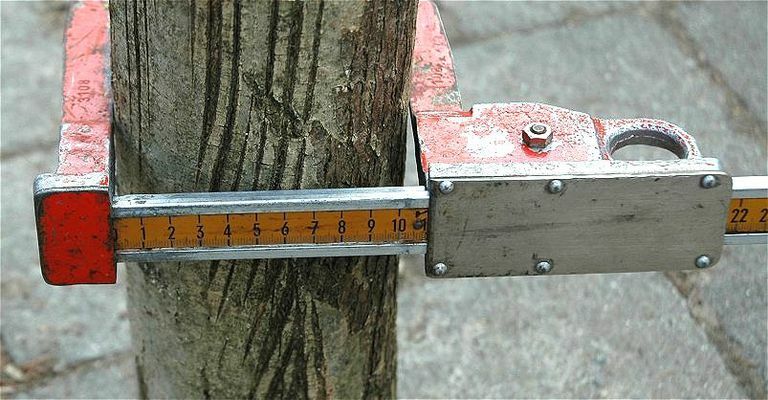 There are calipers that will hug the tree and the measurement is read using the caliper scale. There is also the Biltmore stick that is designed to use a sighting angle at a given distance from the eye and reads the left and right trunk sighting. Measuring the diameter of a normally shaped tree is straightforward. There are other situations where measuring DBH should be handled differently. Measuring a forked tree below DBH: Measure the tree diameter just below the fork swell. The measurement should be made at the normal spot if the tree forks above DBH. Measuring multiple stems from ground root sprouts: Measure each stem diameter at diameter breast height. Measuring a straight tree on a slope: Measure dbh at the upper side of the slope. Measuring a leaning tree: Measure the diameter at 4.5 feet from the base and up the lean. Measuring a Swelling Tree Base or Buttress: Measure the tree just above the swell. If the buttress stops before DBH, measure as usual.